DON'T MISS this Special Deal ! Could you use some expert help with your Facebook Group? 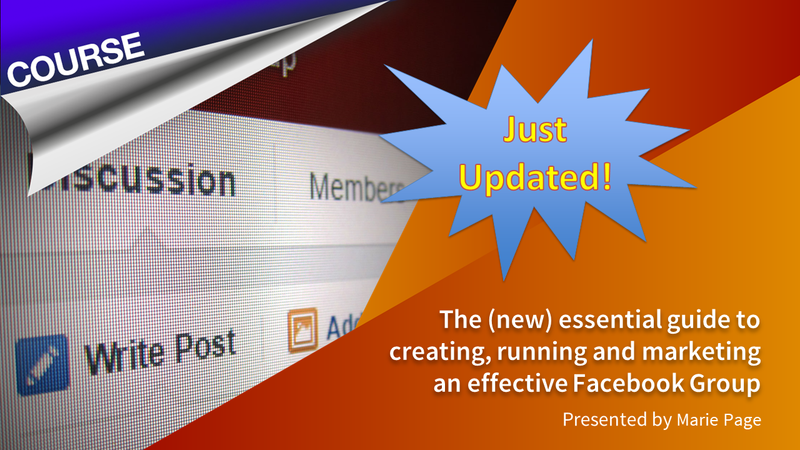 just updated with the very latest information about new Facebook Group features together with all the essential information for businesses to take advantage of this huge new opportunity. Buy today for just $185 instead of the regular price of $397. Yes, you read that right! We’re giving you a crazy 55% discount when you buy the course today. Save a whopping $212 ! With abysmal organic reach on Facebook Pages, clever businesses and organisations are shifting their focus to Facebook Groups as their primary platform for building buzz and community around their brands on Facebook. As well as detailing the many advantages of Groups over Pages, this 7 module online course covers all you need to know to set up, manage, promote and monitor your Facebook Group. And as with all Digiterati courses, the training videos are packed with examples and great ideas for content that you can re-purpose in your own context. You can follow the course at your own pace, whenever you like and on any device - desktop, laptop, tablet or smartphone. Plus you can ask the trainer questions within the course. Written and presented by one of the UK’s leading Facebook Experts and author of the five star-rated book Winning at Facebook Marketing with Zero Budget, this online video-based course covers everything you need to setup, run and manage an active and engaged Facebook Group. Module 1 - Why have a Facebook Group? We provide a brief overview of Facebook's News Feed algorithm and the consequent challenges in organic reach that Pages face. Groups are not only a solution to this but have a number of other significant advantages over Pages. This module examines the differences between Groups and Pages and gives plenty of examples of Groups in action. This module is designed to get your Group up and running. We work through all the things you need to think about prior to launch and then provide a practical guide to creating a Group including an explanation of all the admin settings. We unpack the difference between the Admin and Moderator roles and look at the different options for adding people to your Group. We look at some best practice examples of Group rules and how to reinforce them as well as welcome post ideas and further methods of encouraging new members to introduce themselves. We share some different approaches on welcome posts, pinned posts and descriptions as well as processes for approving new members. Finally we provide detailed instructions on creating cover images that work on all devices as well as a quick look at notifications. Methods for data capture are explored as well as a look at a variety of questions that successful Groups ask prospective members. There’s a step-by-step guide for linking a Group to a Page as well as posting and commenting as a Page in your Group. We also look at the new “Universal Inbox” for connected Groups, Pages and Instagram accounts. Module three covers good practice for the day-to-day running of your Group. We look at innovative ways to welcome new members and also encourage them to introduce themselves. We also work through the challenging topic of who to accept into membership and how to deal with bad behaviour. The implications of blocking a member are explored and techniques to identify people you have blocked, or have blocked admins. Identifying and monitoring new member activity is explored as well as best practice for managing comments (and turning them off if required). The module concludes with some ideas for content, how to sell your products (without annoying your members) and how to encourage better engagement. We also discuss the topic of duplicate or related content across your Page and Group. This module tackles the tricky subject of Group promotion. Once you've created your Group how do you let people know about it. We look at ways that Facebook can help promote your Group, a workaround on using Facebook ads for Group awareness and best practice on gated content and lead magnets to entice members in. Using a real life case study we also consider a launch strategy so that your Group hits the ground running. As well as a detailed live look at Facebook’s own Insights we also walk you through two free third party applications that will provide you with some additional analytics data about your Group. Note that when this module was recorded, Facebook’s own Insights for Groups was not available. Module 6 is still very much worth watching but do also view the end of Module 8 where we go through Facebook’s own Group Insights in detail. Finally we show how to calculate reach and engagement metrics for your Group – data that is not immediately apparent within Insights and requires a little maths! Module 7 summarises some additional tricks and tips for Facebook Groups drilling down into some of the detail about members, visibility statistics of your posts and how to block and reinstate members. We provide a detailed look at what not to do in order to avoid being thrown into Facebook Jail (something that is increasingly common amongst Page Admins). We also warn of potential problems and changes when Group size hits 250 and then 5,000 members. New features such as scheduling posts and group-to-group linking are explained. Finally we show you how to delete a Group (it's actually not as straightforward as you might think) and reveal why a large number of wildly successful Facebook Groups are closing down and starting again from scratch. What has driven the Admins to this drastic action and what lessons have they learned when setting up their new Groups?